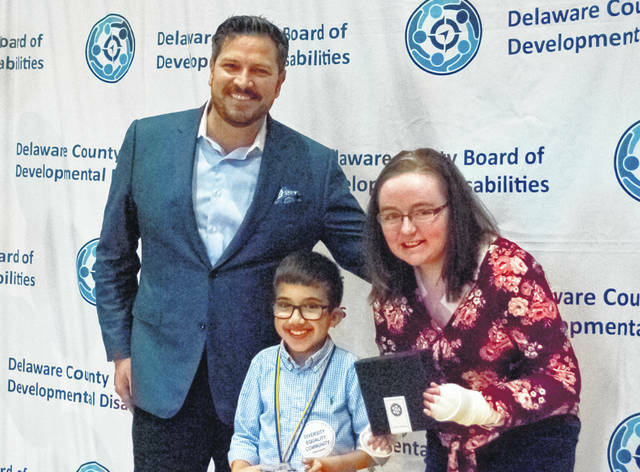 The Delaware County Board of Developmental Disabilities (DCBDD) honored nine recipients during its annual “Lifetime of Giving” event Thursday evening, March 14. Pictured, left to right, are Louis Borowicz, DCBDD president; 9-year-old Ashdin Hoffman, 2019 recipient of the Outstanding Advocate Award; and Rachel Barber, 2018 recipient of the Outstanding Advocate Award. Advocates, service professionals, and others were honored by the Delaware County Board of Developmental Disabilities (DCBDD) during its annual “Lifetime of Giving” event held Thursday (March 14) at Merrick Hall on the Ohio Wesleyan University campus. The annual awards ceremony recognizes people in the community for their contributions to enhance the lives of people with disabilities. The event is held every March, which is designated as National Developmental Disabilities Awareness Month. Anyone within the Delaware County community can be nominated for an award. Louis Borowicz, Delaware County Board of Developmental Disabilities president, was the evening’s award presenter. Rachel Barber, 2018 recipient of the Outstanding Advocate Award, presented the 2019 award to Hoffman. To create inclusion, Hoffman created a movie to help his classmates better understand his disability. The young author and screenplay writer also has a fascination with whistles, for which he carried four around his neck Thursday evening. Miller said the month of awareness provides focus on inclusion, highlighting advocacy, and demonstrates the role people with disabilities play in our community. “It’s a great way to recognize people in our community that are going above and beyond to help people, and a great way to recognize our partners,” she said.